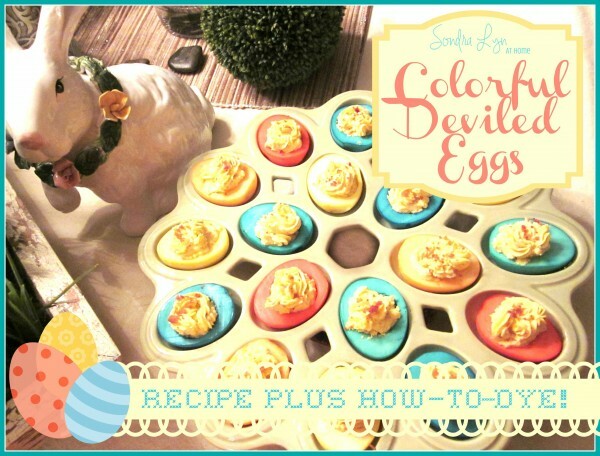 Have you seen these pretty, colorful deviled eggs? They are not only delicious, but also visually very appealing! And this recipe has a yummy twist: BACON! 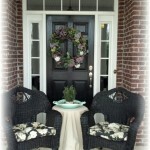 I’ll share the recipe after I give you the scoop on how to boil and dye them. 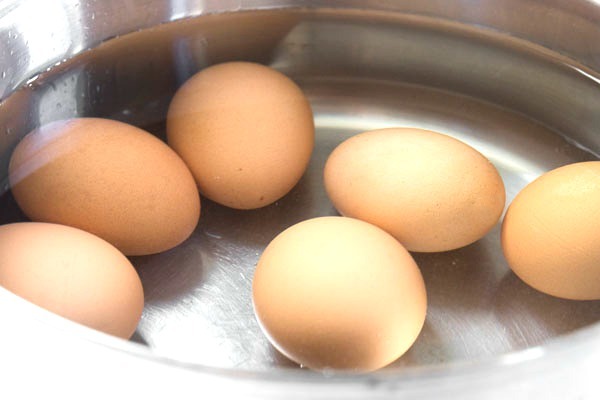 Place room temperature eggs in a single layer in large pot on stove in cool tap water. Cover with water at least one inch above eggs. Over high heat bring just to a boil. Remove from heat and cover. Let stand for 12 minutes for large eggs (9 minutes for medium eggs; 15 minutes for extra large). DRAIN immediately and cool slightly under cold running water or in bowl of ice water. Cut eggs in half and pop out yolks. Place yolks in bowl and refrigerate. 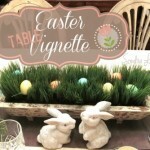 Prepare small bowls or mugs full of hot water/food dye/vinegar just as you would to dye eggs in the shell. 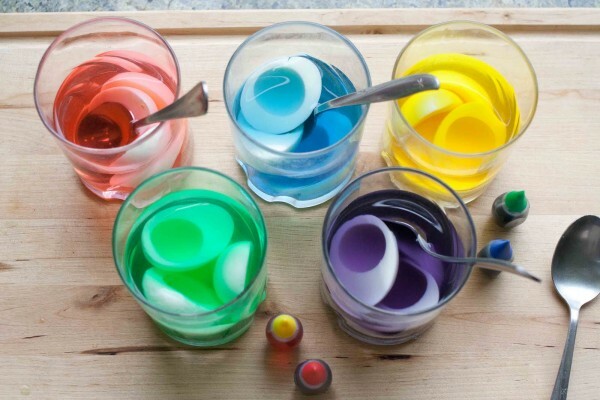 Drop egg white halves in gently and soak until desired color intensity is reached. *It is important to dye eggs after cutting in half so that the insides of the eggs will be colored too. OK. Now for the recipe! The perfect Easter Egg - Dye the whites of boiled eggs and stuff with this delicious Bacon Deviled Egg recipe! Mash egg yolks with mayonnaise, sour cream, mustard, lemon juice, salt and pepper, and half of crumbled bacon. Fill egg white halves with the yolk mixture.If you want to get fancy, use a bag and pipe it into the haves. Lightly sprinkle with paprika, bacon crumbles and chives. Aren’t these fun? And they are such a hit! Most people love deviled eggs anyway, but they will fight over these… I promise! 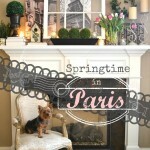 Live at 6 am EST/ 5 am CST, you will be able to link up and then enjoy the links all week! 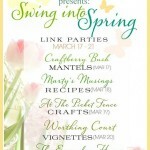 Today the focus is Spring Recipes. You saw mine here- now it’s your turn! 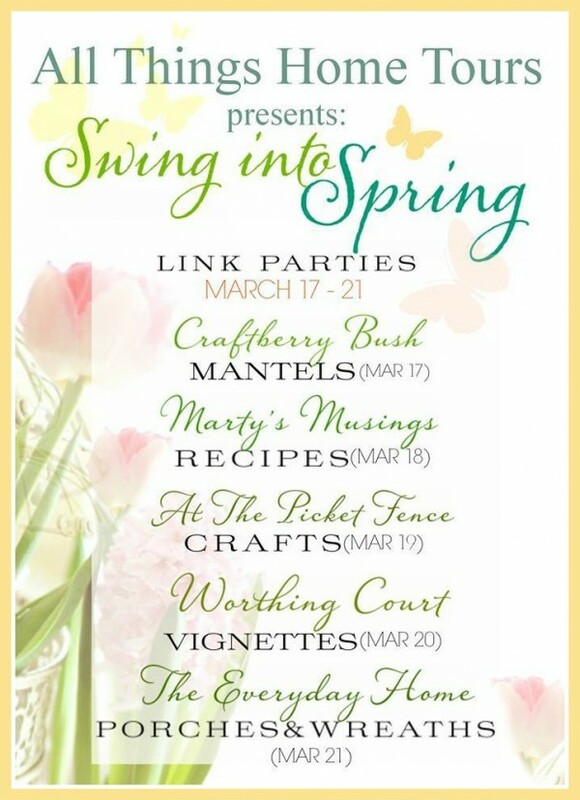 « Let’s Swing Into Spring! How cute! 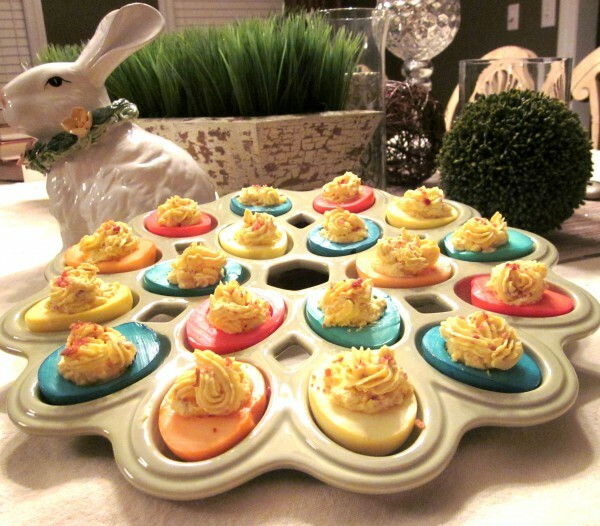 My boys might even eat these fun deviled eggs!